Ahhh, toys. How do you stop them from taking over your entire home and turning it into a cross between Toyworld and a natural disaster recovery zone? I wouldn’t have a clue, but if you have any idea, please let me know. 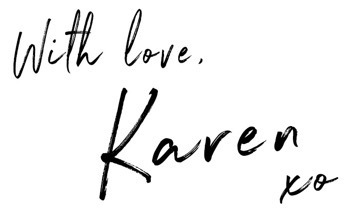 ‘Kay, thanks. The truth is that in a house of four children, I always seem to be picking up toys. The kids are messy, and they create chaos out of thin air like little anarchy alchemists. I, on the other hand, like order and a tidy living space. Too much mess and clutter makes me go a little stir crazy. I actually feel stressed when there is stuff strewn everywhere. In our last home, we had a playroom. I loved our playroom. I loved it more than coffee or Conoisseur ice-creams. How little their bright clashing colours compliment any sort of adult décor. I’m kidding, mostly. I’m actually not as OCD as I realise I sound right now. I’ve embraced a fair amount of chaos as we’ve added children to our family. But I do have a thing for not wanting our living room to be completely overtaken with toys. Enter: our toy rotation system. Not too bad, eh? It’s pretty small and discreet. 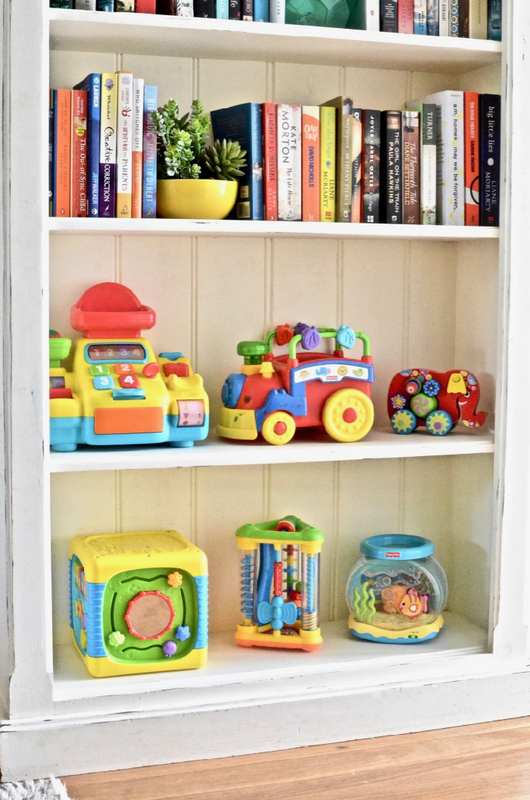 … which used to be a beautifully styled bookcase and is now home to those bulky toys that take up too much room in a box and get played with much more regularly if they’re displayed on a shelf. It’s not my ideal entry feature, but we’re living in a small home with lots of kids, so that’s just life right now. So how on earth do we keep our toys down to what will fit in that one small box + on those two shelves? But for the random toddler toys that get played with out in our living area, my trick is to keep 2/3 of the toys stashed away, and only bring out 1/3 of the collection at any one time. Every so often I just do a box switcheroo: put our current box away on the shelf and pull out a new box. In my ideal fantasy of life this would happen weekly, but let’s be honest, I usually forget. 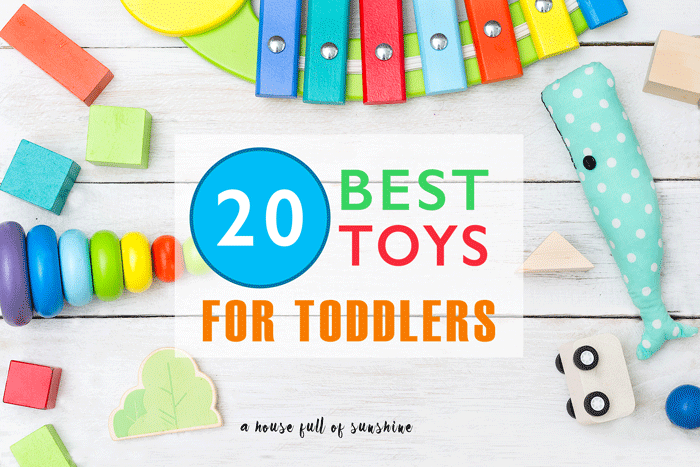 I made sure to include a good variety of toys in each box – something noisy, something that requires fine motor manipulation, some cars, something cuddly, etc. I also culled the toys right down to the most popular and most-used toys. I find that if the boxes are over-filled, Charlie won’t go digging for what’s at the bottom. The less there is in the box, the more likely he is to engage and play with what’s there. Now when we pull out a new box, we have the novelty factor on our side. Everything old is new again! It really is fun to see how much more Charlie engages with his toys when they’ve been hidden away for a little while. As for the bulky shelf-toys, we rotate those too. I use a gigantic storage tub to hold the excess toys. It has a lid and gets tucked away in Charlie’s cupboard. When we switch the toy box over, we also pack away the shelf toys and pull out a new set. So that’s our simple toy rotation system. 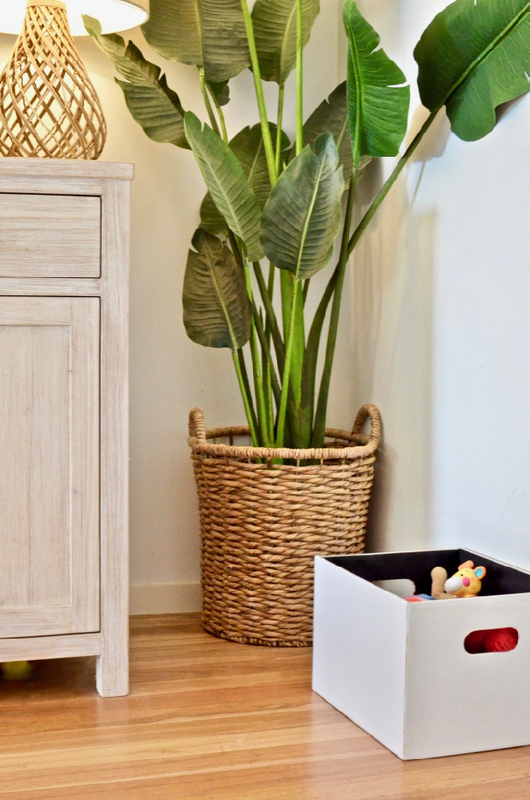 It definitely helps us keep our living room from being overrun with toys, even in a small home with four kids. Want the short version? Here’s an overview. 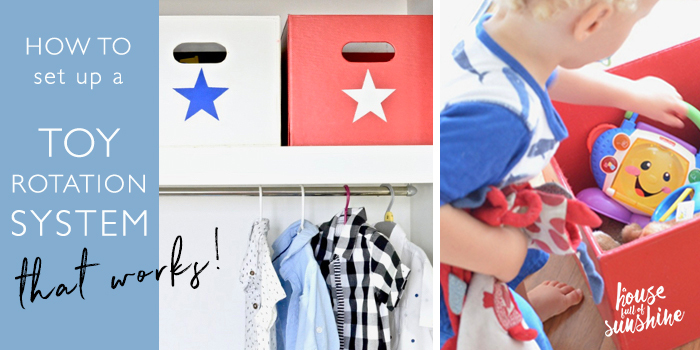 It’s easier for kids to pick up their own toys and put them away when they can’t get everything out at once! Start with a good declutter. Get rid of toys that are broken, outgrown, or unpopular. Get three to four good-sized boxes or baskets. Choose ones that you wouldn’t mind having on display in your living area. 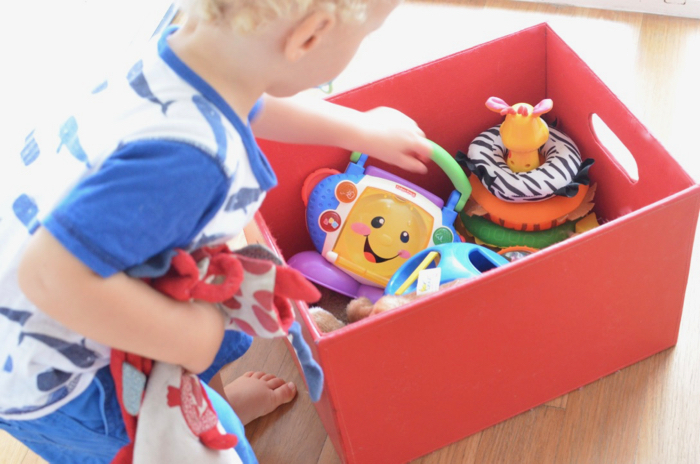 Distribute toys between the boxes or baskets. Try to include a good variety of types of toys in each. 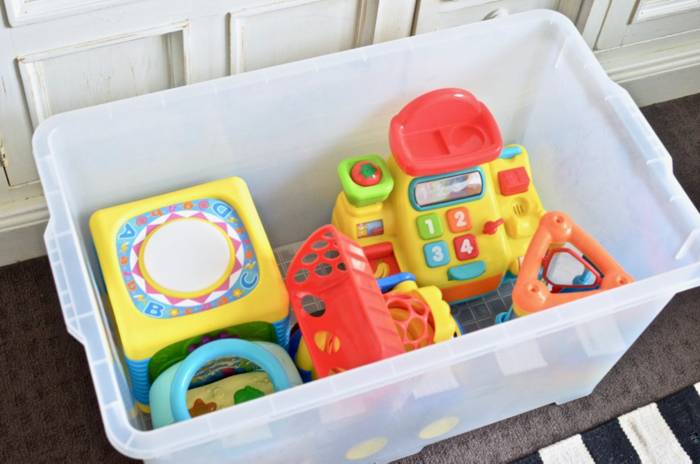 Set up a separate rotation container for more bulky toys, if needed. 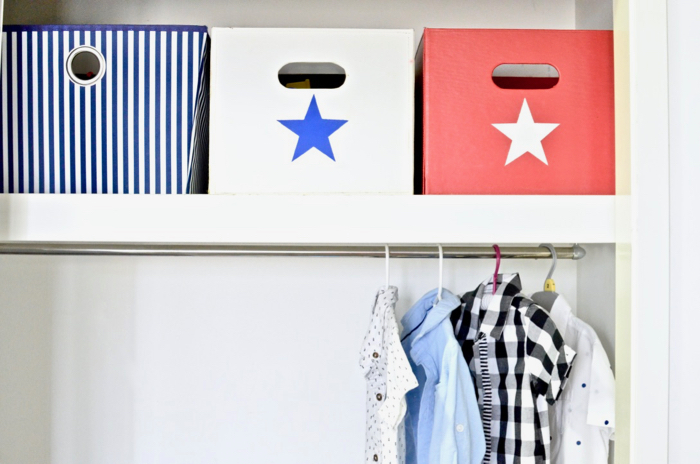 Make room on a high shelf to store the toy boxes, so kids can’t get into them until you pull them down. Rotate the boxes every week or two to keep things fresh! 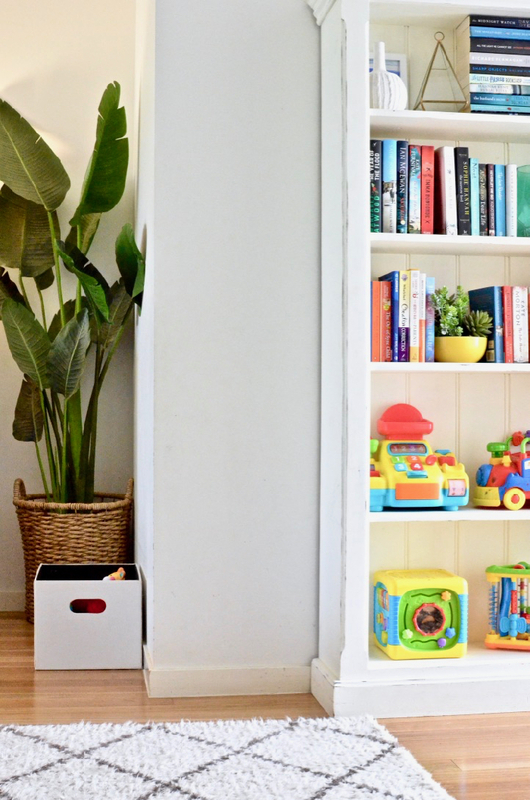 It will help you identify why kids play with some toys more than others, which toys they engage with better and get extended use out of, and which toys are just adding clutter to your home and would honestly not be missed. Still stuck? 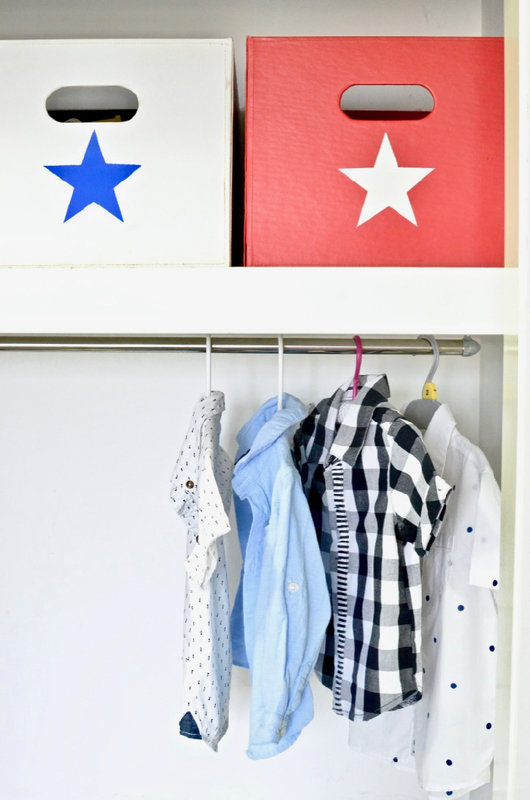 I’ve also shared a checklist of specific things to declutter from a kids’ zone. You can get it for free in this post. That’s the gist of our simple toy rotation system. 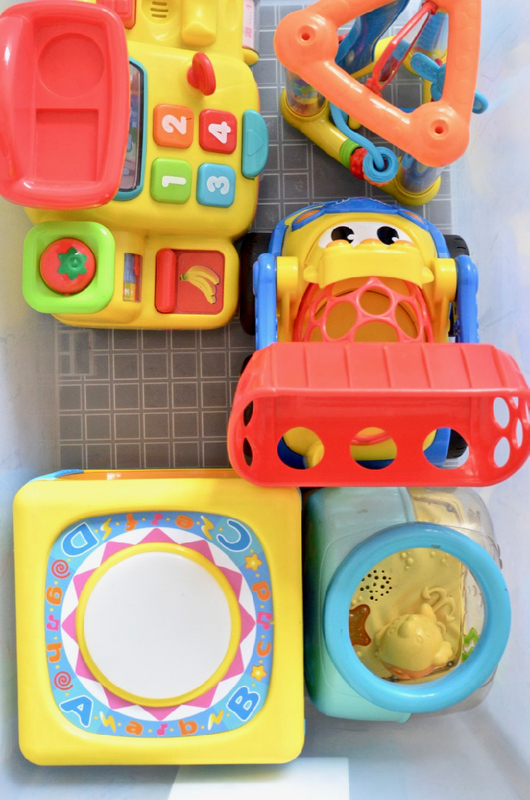 Do you rotate your kids toys? Is this something you would like to try? If you do, let me know how it goes! Until next time, wishing you a house full of sunshine.